Pirate with parrot Spare Tire Cover is customized for your tire size. 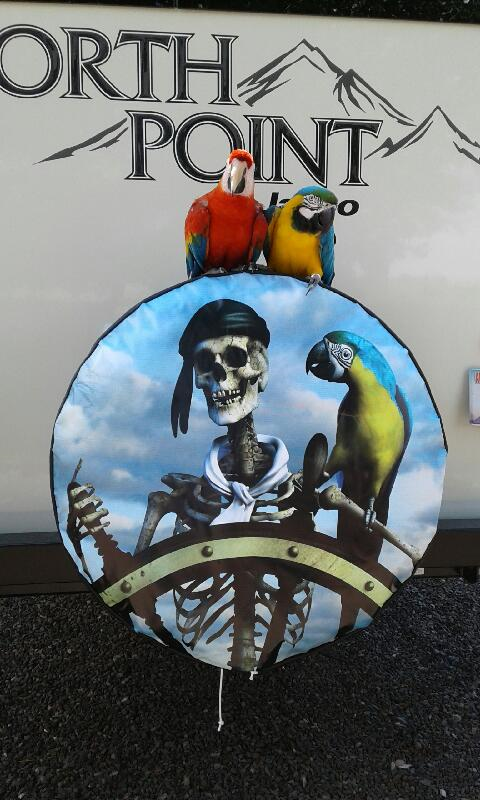 Are you asking yourself what size you need for your pirate with parrot spare tire cover? Pirate at ships wheel with his parrot side kick. Great for any of your voyages on land or sea.Your size is printed on the side wall of your SPARE tire and can be found below the tire name brand. There is no need to measure. Please be sure to check the size on the spare tire, because sometimes the size on the spare tire is different than the size of the tires mounted on the vehicle. For example P255/75r17 or 30×9.50×15 or H78-14. 1-In the middle of the pirate with parrot spare tire cover detail screen is a SIZE field where you can enter your tire size. We promised the lady on the phone a picture of our tire cover with our birds.